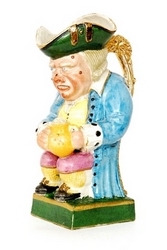 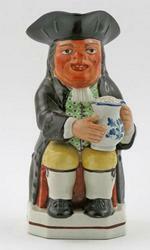 A large 19th Century Toby jug, seated wearing brightly coloured attire holding a foaming jug of ale, all raised to a green step base, his face with warts and blue eyes, unmarked, height 34cm. 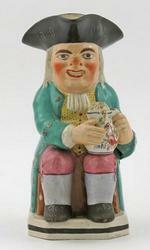 Martha Gunn Staffordshire earthenware Toby Jug, attributed to Ralph Wood, 10inches high. 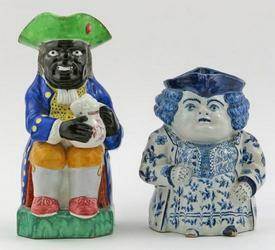 English, circa 1820. 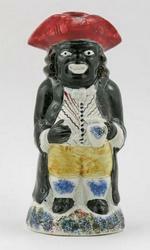 Provenance: the estate of Elsie Seabrook, Tunica, Mississippi. 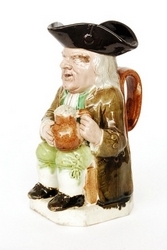 A Yorkshire Toby jug of Ordinary type c.1830, wearing a distinctive green tartan coat, holding a jug and hexagonal cup, with a figurehead handle, the inside of hat's brim sponged in brown and pink, 24.5cm. 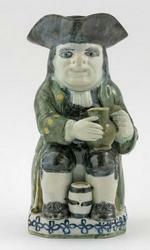 A Staffordshire pearlware Toby jug late 18th century, of Ordinary Wood type, a jug of ale on one knee and an upright barrel between his feet, his pipe resting by his right leg, decorated in a muted palette of deep blue and green, the edge of the base moulded and painted with stylized flowerheads, 25cm. 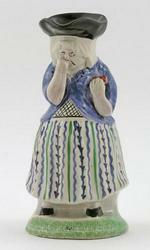 A Staffordshire Gin Woman Toby jug mid 19th century, standing and holding a bottle in her left hand, a cup or glass in her right, brightly enamelled with striped collar and skirt, 20.5cm. 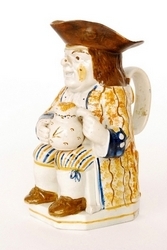 A Walton pearlware Toby jug early 19th century, of traditional form, wearing a brown coat and checked waistcoat, with warty and ruddy complexion, his foaming jug of ale painted with a blue foliate design, applied scroll mark to the base, 25.5cm. 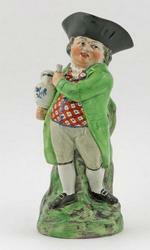 A Walton Hearty Good Fellow Toby jug c.1820-30, standing with body slightly turned to the left, wearing a bold checked waistcoat and a green coat, holding a jug of ale in his right hand, a cup in his left, 28.5cm. 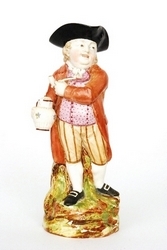 A pearlware Hearty Good Fellow Toby jug 19th century, standing with body turned slightly to the left, holding a jug of ale in his right hand, a clay pipe in his left, wearing a bold checked waistcoat, 27cm. 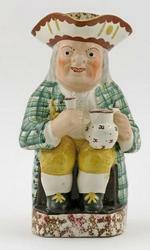 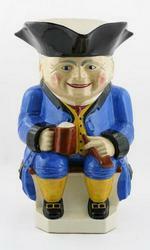 A massive Devonmoor advertising Toby jug c.1930, of usual form, seated and holding a tankard and a pipe, wearing a blue coat and happy expression, 61cm. 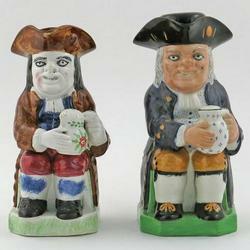 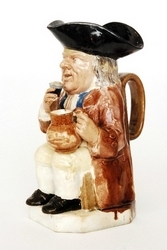 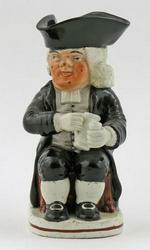 A Drunken Parson Toby jug c.1815-20, seated with a jug of ale and a cup, his bewigged head turned to the right, typically dressed in black coat and breeches with buckled shoes, 20.5cm. 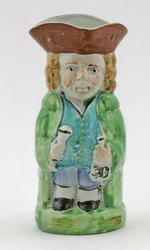 A small Standing Man Toby jug c.1820, dressed in a long green coat and holding a bottle and cup against his stomach, 18.5cm. 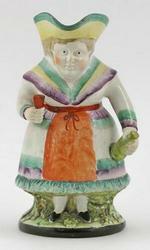 A female Snuff Taker Toby jug mid 19th century, of Portobello type, standing and taking a pinch of snuff, wearing a striped skirt and blue jacket, the base sponged in green, 24.5cm. 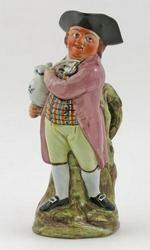 A pearlware Toby jug 19th century, of Ordinary type, his foaming ale spilling over the side of his floral-decorated jug, his coat decorated in a bright turquoise green, 23cm.